I have a bad taste in my mouth this eve; and not simply because I slept badly, and snored. As a Doctor, part of the deal, maybe most of the deal, maybe ALL of the deal is being the patient's advocate. With all the privilege it entails, patients expect, deserve, demand that we do our best for them; that we do our best, even when others disagree with us. And this morning I failed my patient; I missed what would turn out to be the crucial detail in her history, although I did not fail to see how ill she was. But I was unable to convince my colleagues of this fact; allowed myself to be pushed around; I could not convince myself to step up for her and force others to help me treat her. I find this incredibly frustrating; especially when, as this case did, a patient straddles the day / night boundary. With the dawning of the day, the Hospital stirs itself to life, and suddenly everyone is interested in your case, and mostly in criticising your management thereof. 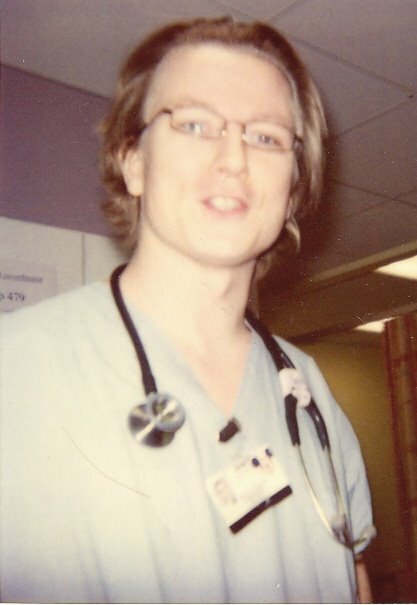 I'm not sure the delay will affect outcome; but I was stung to the quick, having spent 2 hours trying to attract speciality assistance, to have them phone me and 'pass comment' on the delay I was causing. Sometimes, I hate my job. For the record, the case was, I suspect, Boerhaave's Syndrome. The patient presented with abdominal pain, following vomiting. 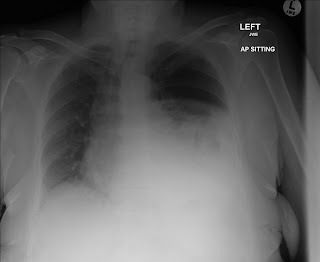 Radiograph showed a pneumothorax, possibly pneumomediastinum, and loculated effusion in the left chest, producing a degree of mediastinal shift. I never cease to be amazed how quickly my colleagues disavow themselves of potential responsibility; all hail Specialisation. I promised her husband we'd get to the bottom of it, and see her right. I couldn't look him in the face on my way out. Is there such thing as a "Gastrothorax"? Thats what radiology called it. the lord high consultant shouted at radiology and the bod incharge came down did the CT and the swallow thingamy. All of radiology came to play along with most of surgery. According to the head radiology bod, THe drain saved her for the surgons to do there stuff. You Dr Shroom are a Hero. Well, I am my own hero, but beyond that... thanks anyway. Gastrothorax sounds like stomach in chest, which was my first fear, and why I was reluctant to put drain in early; I'll be interested to read the report tomorrow. I might also have to demand satisfaction from my CTS colleagues. jesus, what happened in my day hardly compares.